First Brexit and now Trump! Donald Trump has been elected the 45th President of the United States and he shall be entering the White house on January the 20th. Wisconsin was the last piece of his electoral jigsaw that confirmed his victory. “Buy the rumor, sell the fact” is the quote of the day. The choice of the American people has really caused a massive financial wave in the markets and the stock market has plummeted. All markets are clearly in the red with the instability that the Donald Trump shall bring to the table. As we mentioned in our Platinum Elite US Presidential Report, if Donald Trump wins, it would be a worldwide chaos. EUR/USD is only temporarily up in my opinion as this is not a safe haven currency and will be shorting all the way down to 1.0950 within a matter of weeks. GBP/USD is still struggling to move up above the runaway gap from this Sunday’s market open. USD/JPY is collapsing. When the markets react as such the world looks for a safe-haven currency, that’s correct and the Yen is primarily a safe haven currency. If you are learning trading, please be aware of BOJ Interventions. You may see sudden spikes in the market and this could result mixed technicals. USD/CAD is currently moving higher and the reason for this is because of worsening trade relations and the Canadian economy is on the verge of a massive recession. AUD/USD is sliding. It is also a risk currency. NZD/USD is slightly lower showing more resilience. Stock markets in Asia are crashing and US futures are also deep down. 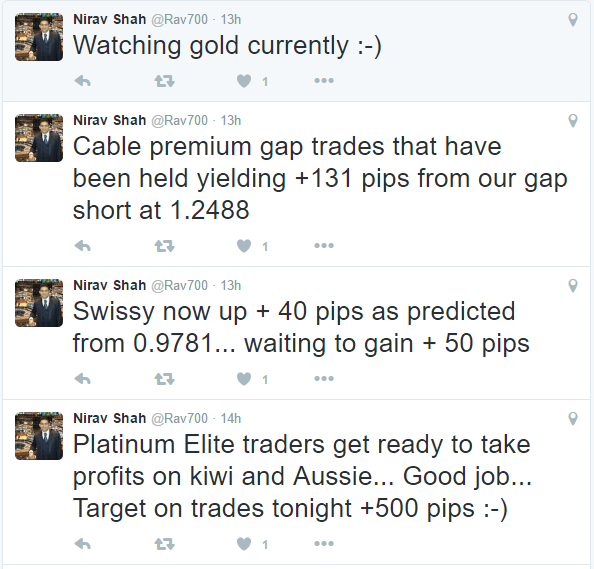 We traded this event live using the Platinum Long Term Strategy and made 700 + Pips just like we did with Brexit. Click on the Chart below for a sneak peak of the trades that we are holding. Are you ready to take advantage of the US Election aftermath? up to 400 Pips in the next 8 days time. We also gave out a live trade last night on Twitter, which we rarely do. Please follow us to get more updates. Learn how to trade the Platinum Way. Download our Free eBook that reveals the secrets on how professionals make millions in the financial markets.